It’s crispy (at least that’s the way I like it). Bacon goes with eggs, and I love eggs. It smells soooo good when it’s cooking. BLT’s aren’t possible without it. They serve it at the Eveready Diner in Hyde Park, on the way to Rhinebeck. If I’m going to eat meat, I may as well enjoy some bacon. Since I don’t eat bacon very often, when I do, it’s a special occasion. Where would this Ten on Tuesday be without bacon? Previous Ten on Tuesday: Road trip! 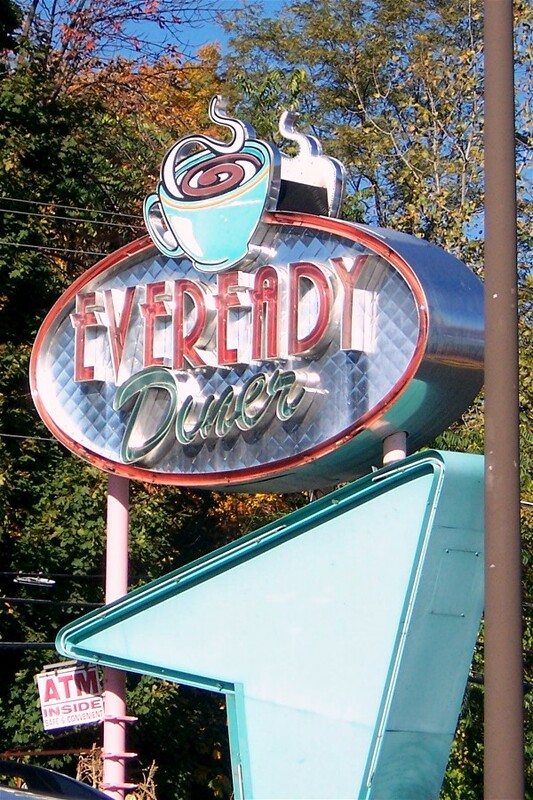 I was just thinking of the Eveready Diner yesterday! Bacon is my guilty pleasure. I won't eat meat every day, but I crave bacon. I personally love it just a little underdone. With fresh tomatoes and mayo….now I'm hungry! The other day I was walking to work past the Golden Pear and Sam's and the air smelled like bacon, it made me smile. I dream, on some fall Rhinebecky day, that you and I will gather at that Eveready Diner for a nice heaping helping of bacon. Until then, I'll simply shout a loud and slightly porcine "amen." Bacon is such a tasty treat-meat! So good with nearly everything. . .
Bacon is a treat for me at Sunday morning breakfasts. And I love it on any sandwich. It tastes good too! I even like a plain bacon sandwich (without the l or t). Some friends discovered the pork-avoiding equivalent of a BLT this weekend–a crisped fried chicken skin sandwich. I was horrified, until I tasted it. Love the bacon…except in a cupcake. Found that out recently when I sampled a new cupcake shop in town. Their Macon Bacon cupcake sounded intriguing with its little bacon square perched atop the lofty white icing. No. A thousand times no. A resulting stomachache kept me up all night and going for my beloved Alka Seltzer. Otherwise, bring on the bacon!